yellow tapeta silk anarkali suit with printed dupattaFabric : Tapeta silk gown ( semi stich ) Length 56+ Flair 4.25 Digital print Geor.. Fabric :Top Georget with embroidery & thread work all over nylon silk shararanazmin duppata Full stich outfit upto 44 size.. Fabric : Georget top with heavy zari work all over front & back ( stichable upto 42 )Georget sharara ( full stich )Net duppata with Bord.. Fabric :Top heavy jaikard butti Georget shararanet duppata with sequence work Full stich outfit upto 44 size.. 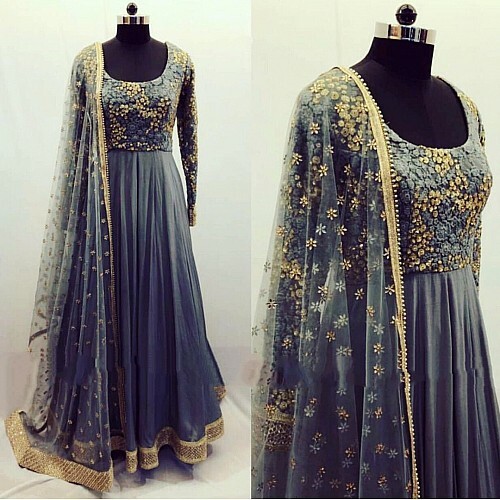 Fabric :heavy satin banglori jacket with thread zari + mirror work + tassels border Work ( full stich upto 42 )satin Georget silk plazzo inner at.. Fabric : Net suit with heavy machine embroidery all over( stichable upto 42 )Flair 3.15 meterLength 48’’Net duppata with sequence worksantoon bot.. Fabric :heavy butterfly net lehnga with sequence work borders & heavy frills ( 3.5 meter flair )heavy sequence work blouse + zari work on sleeves&.. Fabric :Georget dress with thread work all over ( 3 meter flair )( semi stich upto 44+ ) ( Length 52 )3 shaded chiffon Pedding dying duppata with..